Believe it or not, there used to be no signage on Scott Street identifying the eastern side of the street as part of Duboce Park which includes the Rec Center, Labyrinth, and grassy areas. 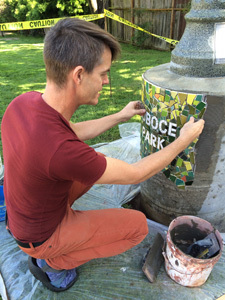 To remedy that situation and turn a drab concrete pillar into a work of art that directs people to the various parts of the park, artist Blake Sherlock installed a colorful mosaic piece in early October to surround the concrete pillar that supports the light pole located at the top of the passageway between the Rec Center and Carmelita Street. 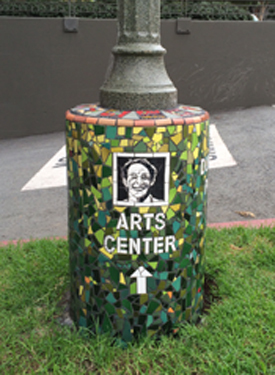 As you walk south on Scott Street toward the Rec Center, you are greeted by a smiling Harvey Milk pointing the way to the “Rec Center.” Walking north, there is a colorful ball and arrow that directing you to the “Play” areas of the park – the Playground, the Youth Play Area, and Dog Play Area. As you walk west up the passageway, there is a labyrinth with an arrow pointing right towards the site. 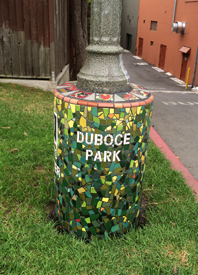 That mosaic labyrinth in an exact copy of the table labyrinth on Scott St. As you walk past on Scott Street, a mosaic “Duboce Park” faces the street , providing identification for the park. The artist, Blake Sherlock, has lived in San Pedro de Laguna on Lake Atitlan in Guatemala for the past ten years. Sherlock was raised in Boise, went to school at Brown and RISD, and lived in the Lower Haight for a time in the mid- 1990s. 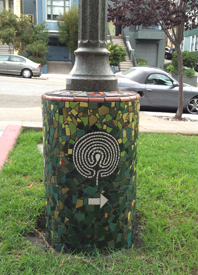 Sherlock designed and installed the mosaic work around the base and sides of the table labyrinth at the Scott Street Labyrinth, as well as the handicap access and No Skateboarding signs. He led the mosaic tile workshop at the Tag Sale (and day after) in 2006 where neighbors created the 225 square tiles that now surround the labyrinth. 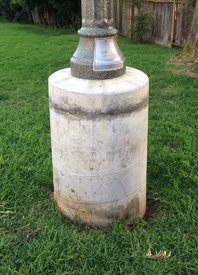 The last ten tiles left over from that event are now on the top of the pillar piece.